January is the month when I like to experiment with more whole grain recipes, so I bought bag of King Arthur White Whole Wheat Flour to try some new things. This lemon poppy seed bread is adapted from the King Arthur Book of Whole Grain Baking and it’s delicious. It’s very lemony, has a little crunchiness from the poppy seeds, and you can eat it for breakfast knowing you’ve at least got a few whole grains in. About oat flour, if you have a coffee grinder it’s pretty easy to make yourself – especially for instances like this when you only need 1/2 cup. I always grind my own. As for the glaze, I changed it a bit from the original and used my favorite melted butter lemon icing which drizzles nicely, sets quickly, and is opaque. Preheat the oven to 350 degrees F. Grease and flour a 9×5 inch metal loaf pan. Mix together the flours, baking powder, baking soda and salt. Set aside. Cream the butter and sugar with an electric mixer, scraping sides of bowl. Beat in eggs, one at a time. Beat in the lemon zest. Add 1/3 of the flour mixture and stir it in by hand or using lowest speed of mixer. Add some of the lemon juice, another 1/3 of the flour, remaining lemon juice and the rest of the flour, stirring to mix. Stir in the yogurt and poppy seeds. Transfer to the pan and bake on center rack for 1 hour and 5 minutes. Cool on a rack for 20 minutes. Loosen from pan with a knife. Let cool some more, then flip from pan. To make the icing, melt the butter in a bowl or large Pyrex mixing cup what I like to use). Stir in the powdered sugar so that it’s lumpy and thick. Add the lemon juice one tablespoon at a time stirring until you get a nice drizzling consistency. Drizzle over the cooled loaf. You can also make oat flour in your food processor or blender. It might not be as fine as store-bought, but it’s worked for me in the past. The recipe looks delicious, by the way. I still haven’t purchased the white whole flour. We use whole wheat flour all the time to make bread, and I just don’t think about the white whole wheat unless I see it in a blog recipe. Ooooh, yum! 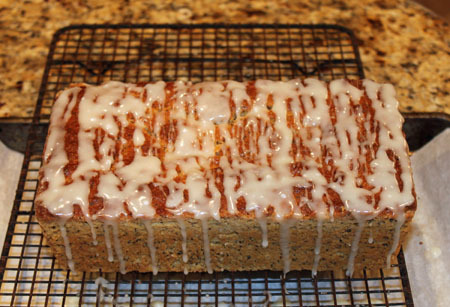 I love lemon poppy seed bread but I’ve never made it before. This looks so good! I never thought to make my own oat flour, but it makes complete sense! Hmm, lemon yogurt. That’s interesting. I’m all for whole grains whenever possible. Funny, TWD this week is poppy seed muffins that I’m planning to make tomorrow. Tis the season. so yep, I will definitely be printing this one out.